This simple guest house is located 15 minutes’ walk from the Alhambra the Realejo district of Granada. It offers comfortable, heated rooms with free WiFi, 5 minutes’ walk from the historic centre. 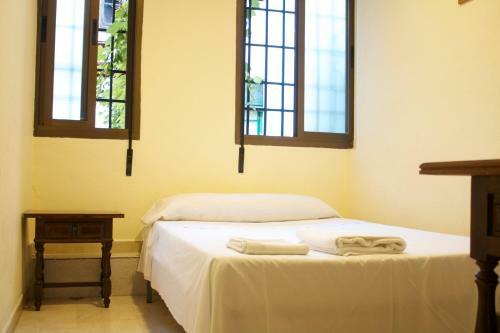 The modestly decorated rooms at Hostal Bocanegra are bright and come with a desk and a private bathroom with shower. Luggage and ski storage are also provided. Bocanegra has a drinks vending machine and is within a 5-minute walk of some of Granada’s most famous tapas bars. The house can offer tourist information and arrange ticket reservation. Granada Cathedral and the Royal Chapel are both a 15-minute walk away, while the Ski Resorts of the Sierra Nevada are just 35 km away. The number SN1 bus stops less than 300 m from Hostal Bocanegra. A bus to Federico Garcia Lorca Airport, 25 km away, can be caught just outside Granada Cathedral. The hostel offers 17 rooms, all exterior and equipped with private bathroom or shower, heating, and free wi-fi connection. Among the additional services that hostel bocanegra has, we can highlight the luggage and ski equipment, laundry and social lounge. This hotel is 702 metres from the Alhambra entrance, 1118 metres from Plaza Nueva (the absolute centre of Granada), 2650 metres from the train station and 4100 metres from the bus station.